In via Gioacchino Murat, Torre Annunziata. Non ancora visitabile. Not yet open for visits. Secondo la Soprintendenza, la villa, non ancora visitabile, merita un cenno, sia per la sua destinazione, diversa da quella della villa di Poppea, sia per i materiali rinvenuti, sia infine per quanto i risultati degli Scavi hanno offerto di nuovo alla soluzione del problema, ad Oplontis, delle ville in rapporto al territorio. La villa, detta anche "di Lucius Crassius Tertius" da un sigillo in bronzo rinvenuto, risalente alla fine del II sec. a. C., è venuta alla luce casualmente nel 1974, a seguito dei lavori di costruzione di una scuola. 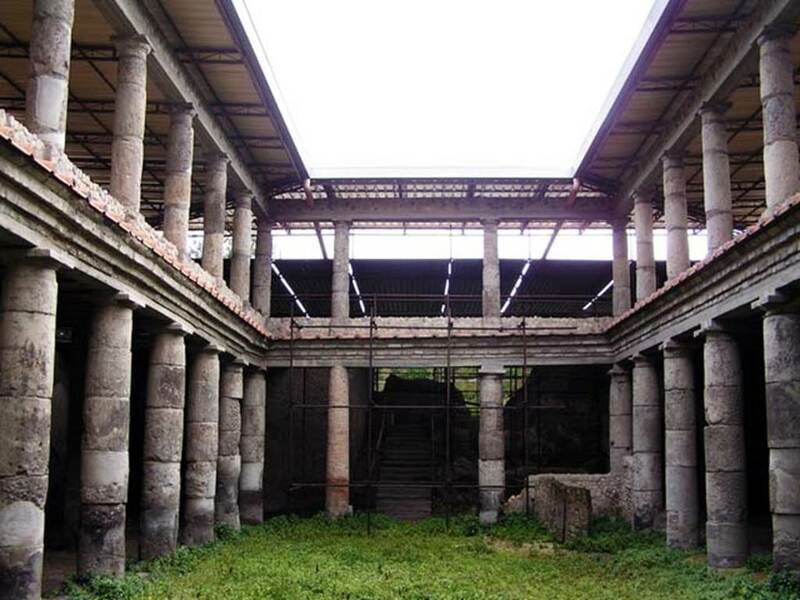 [translation] According to the Soprintendenza, the villa, not yet open for visiting, deserves to be mentioned, both for its purpose, different from that of the villa of Poppea, for the materials recovered, and finally for how much the results of the excavations have offered new solutions of the problem, at Oplontis, of the villas in relationship to the territory. The villa, called "of Lucius Crassius Tertius" from a bronze seal found and dated to the end of the second century B.C., came to light by chance in 1974, as a result of the construction of a school. Villa rustica di Lucius Crassius Tertius. 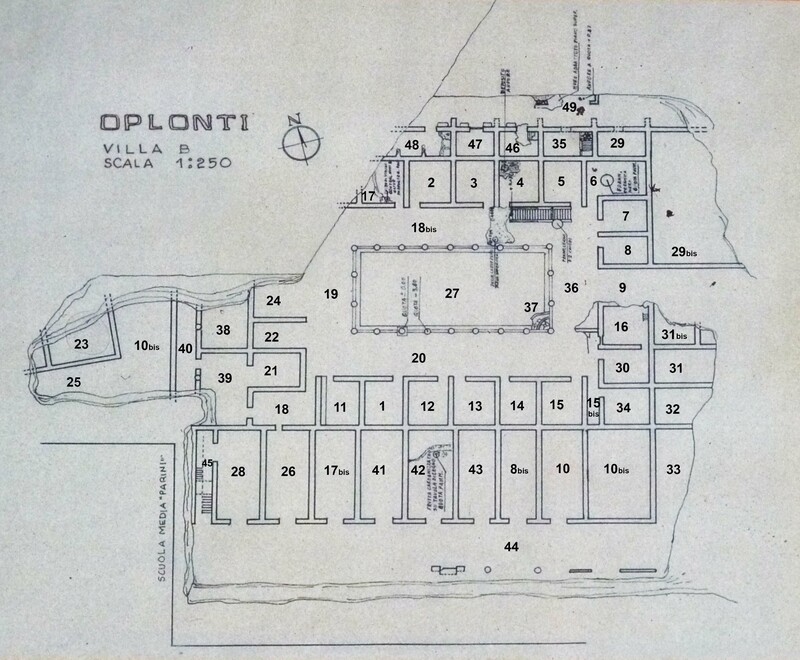 Plan showing location of villa and the Villa di Poppea. See Malandrino C., 1981, Sylva Mala II, p. 4. The site of Villa B lies approximately 300 metres to the east of Villa A, and like Villa A, it is a building of the Roman era that was destroyed by the 79 C.E. eruption of Mount Vesuvius. Though located very near the luxurious and sprawling Villa A, Villa B is strikingly different in what it preserves, and from its remains we can also surmise that it had a very different function from its opulent neighbour. Whereas Villa A is clearly a luxury villa designed for otium, or leisure, Villa B may not even be a villa in the traditional sense, but rather some type of emporium or distribution centre. Its spaces are meant not for leisure but for negotium, or industry. Moreover, the presence of two nearby roads, and what may be a row of townhouses to the north, suggests that Villa B occupies a position in a small settlement or town, perhaps even the town of Oplontis itself. Barbet, A., 1985. Le peinture murale romaine. Paris: Picard, pp. 99-100. Biasiotti, A., 2003. “I mecanismi di riferma e chiusura della cassaforte.” In Storie da un eruzione: Pompei, Ercolano, Oplontis. Milan: Electa, pp. 172-173. Casale A., Bianco A., Primo contributo alla topografia del suburbio pompeiano: Supplemento al n. 15 di ANTIQUA ottobre-dicembre 1979, 116, p. 46. D’Ambrosio, A., 1987. “Oplontis: Attività dell’Ufficio Scavi, 1984-1985.” Rivista di Studi Pompeiani 1 (1987): pp. 173-76. D’Ambrosio, A., 1991-2. 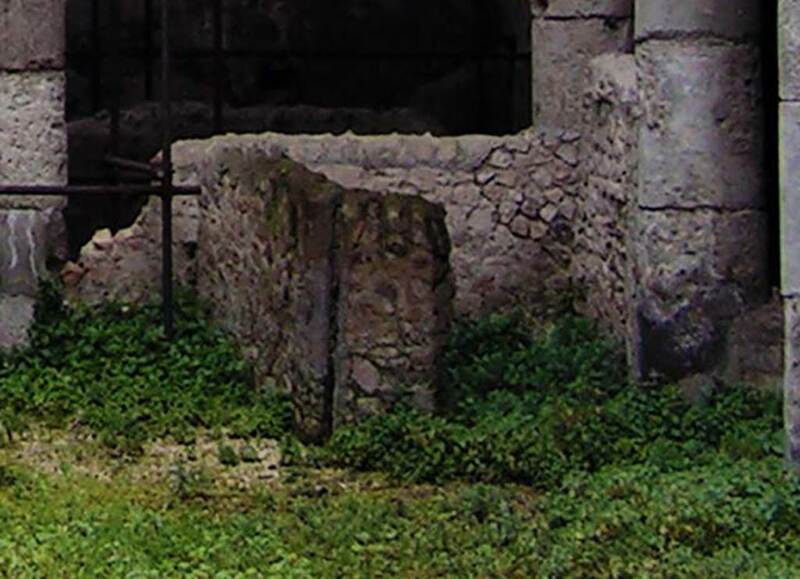 “Oplontis: Attività dell’Ufficio Scavi, 1991.” Rivista di Studi Pompeiani 5 (1991-92): pp. 217-19. D’Ambrosio, A., 2001. Women and Beauty in Pompeii. Roma: Bretschneider. Di Felice, P., 1990. “Gli ori di Oplontis: un esperimento riuscito.” Antiqua 15 (1990): pp. 42-43. Elefante, M., 1988. “Testimonianze epigrafiche della gens Crassia.” Rivista di Studi Pompeiani 2 (1988): pp. 99-102. Fergola, L., 2003. 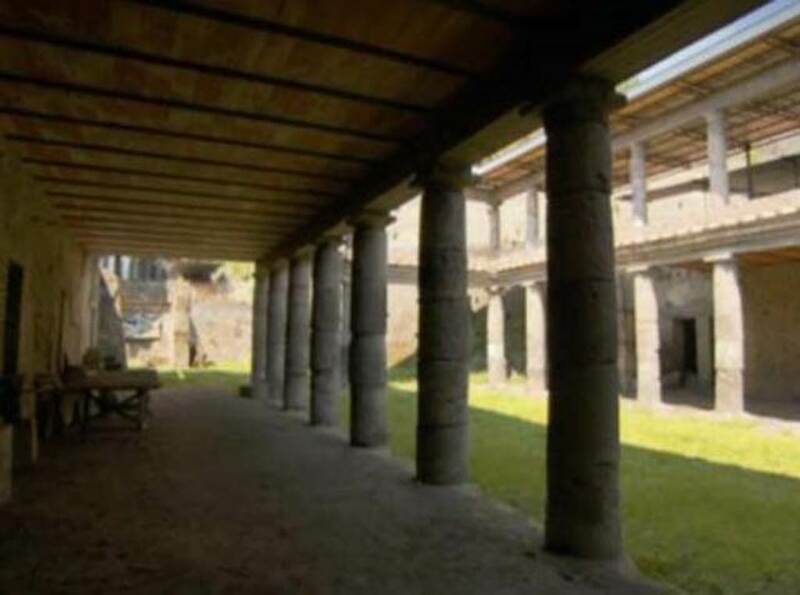 “La Villa B.” In Storie da un eruzione: Pompei, Ercolano, Oplontis. Milan: Electa, pp. 152-171. Fergola, L., 2004. Oplontis, 40 Anni di Ricerca. Exh. Cat. Boscoreale 28 July-20 September 2004. Pompeii: Soprintendenza Archeologica di Pompei. Fergola, L., 2004. 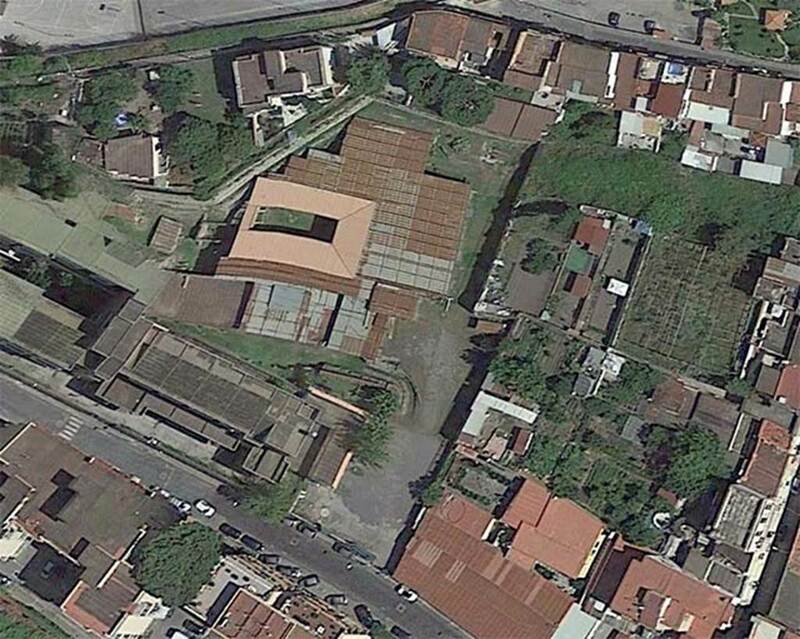 Oplontis e le sue ville. Pompei: Flavius. Fergola, L. and Pagano M., 1998. Oplontis - Le splendide ville romane di Torre Annunziata – Itinerario Archeologico Ragionato. Napoli: T & M.
Gorini, G., 1968. “I medaglioni d’oro di Augusto.” Annali dell’Istituto Italiano di Numismatica 15: pp. 39-61. Gorini, G., 1984. “Ritrovamenti.” Rivista Italiana di Numismatica 86: pp. 231-32. Jashemski, W., 1987. “Recently Excavated Gardens and Cultivated Land of the Villas of Boscoreale and Oplontis.” Ancient Roman Villas Gardens. Dumbarton Oaks Colloquium on the History of Landscape Architecture 10: pp. 31-75. Kockel V., 1985. Funde und Forschungen in den Vesuvstädten 1: Archäologischer Anzeiger Heft 3, p. 552ff. Lagi De Caro, A., 1983. “Notiziario: Villa B di Oplontis.” Pompeii Herculaneum Stabiae 1: pp. 369-75. Malandrino, C., 1981, Sylva Mala II, p. 3-4. Malandrino, C., 1977. Oplontis, Napoli., pp. 81ff. and fig. 13 n. 14. Morelli, V. C., 2003. “Monete dal cassettino.” In Storie da un eruzione: Pompei, Ercolano, Oplontis. Milan: Electa, pp. 175-197. Morelli, V. C., 2003. “Lo scheletro n. 27 e il suo “tesoro” monetale.” In Storie da un eruzione: Pompei, Ercolano, Oplontis. Milan: Electa, p. 174. Meyer, F. G., 1988. “Food Plants Identified from Carbonized Remains at Pompeii and Other Vesuvian Sites.” In Studia Pompeiana et Classica in Honor of Wilhelmina F. Jashemski, 1. Pompeiana. New York: Caratzas, pp. 183-229. Prosperi, M., 1984. “Interessanti reperti venuti alla luce negli scavi di Oplonti. Recuperati preziosi, monete e scheletri nella villa di Poppea.” La Provincia di Napoli 6, no. 6: pp. 39-42. Prosperi, M., 1987. “L’oro d’Oplontis.” Over France Anno 1, no. 0: pp. 18-21. Prosperi, M., 1984. “Oplonti: resti umani, monete e gioielli.” Antiqua 9, no. 3-4: pp. 102-3. Ricciardi, M., and Aprile G.G., 1988. “Identification of Some Carbonized Plant Remains Form the Archaeological Area of Oplontis.” in Studia Pompeiana et Classica in Honor of Wilhelmina F. Jashemski, 1. Pompeiana, New York: Caratzas, pp. 317-25. Van der Poel, H. B., 1981. Corpus Topographicum Pompeianum, Part V. Austin: University of Texas, No. 56, p. 22. Oplontis, Villa of Lucius Crassius Tertius. Plan on display in Oplontis in 2011. Detail from photo courtesy of Michael Binns. 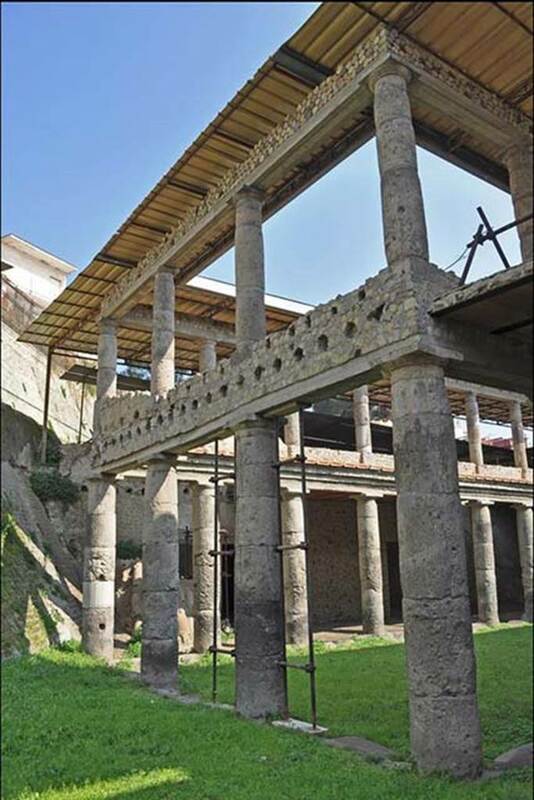 The structure’s plan reveals a central courtyard surrounded by a two-storey peristyle of Nocera tufa columns. Excavators uncovered and restored more than seventy rooms, on both ground- and second-story levels. On the ground level, barrel-vaulted rooms, each with a single large doorway, line all four sides of the courtyard. These ground-floor rooms preserve little or no decoration and reveal masonry predominantly in opus incertum and opus reticulatum. Excavators found remnants of a wooden stairway to the upper floor at the northeast corner of the peristyle; its impression is still visible in the wall plaster. At the south corner, a low structure comprised of thin rubble walls may have been a latrine. The eastern side preserves what seems to be the primary entrance into the courtyard. On the south side of the building, and facing south, eight storerooms open onto a what may have been a large portico. To the west stand the partially-excavated remains of two rooms that belong to another building. To the north, a small street separates Villa B from what appears to be a row of two-storied houses (also only partially excavated) that faced the north side of the villa. 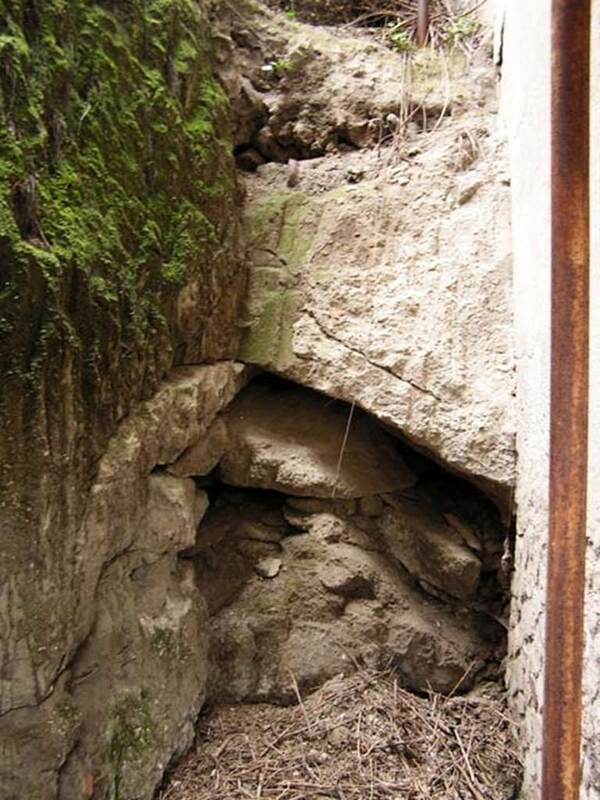 During coring operations sponsored by the Oplontis Project in 2009 and 2010, geologist Giovanni di Maio found evidence of a road to the east of the villa, in an area that is still unexcavated. This road is likely to be a north-south road running along the eastern facade of the complex; it was probably from this road that one entered the courtyard. 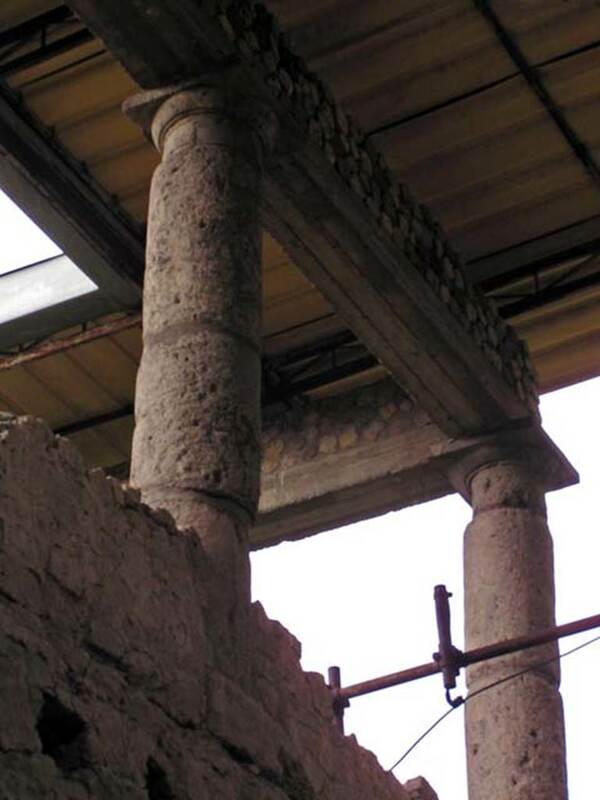 A preliminary examination of the remains suggests that Villa B was originally constructed at the end of the second century B.C.E., as evidenced by the use of Nocera tufa columns typical of that period. Brick repairs to that peristyle and the extensive use of opus reticulatum—both typical of post-62 C.E. 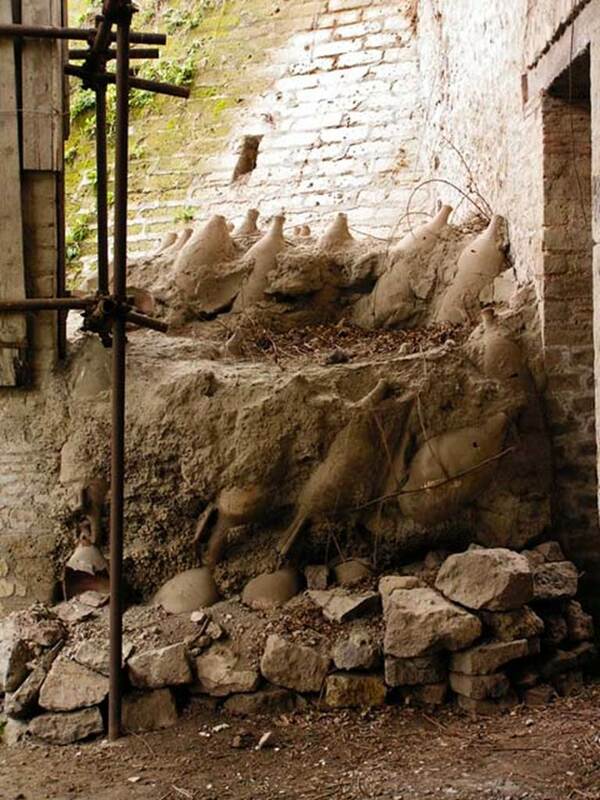 earthquake construction at Pompeii—may suggest a renovation of the structure in the years before the eruption of 79 C.E. Villa B preserves very little evidence of decoration. Only simple white plaster of a type common to utilitarian spaces in Roman buildings survives on the ground floor. The upper-floor rooms preserve some simple painting schemes, most datable to the Fourth Style (C.E. 45-79). These include simple designs of colour fields with carpet borders. There is a fragmentary Nilotic painting, later covered by Fourth-Style painting, as well as a painted lararium. Preserved in another room is a fragment of schematic Second-Style decoration (ca. 50 B.C.E. ), a carry-over from an earlier decorative phase. Kockel V., 1985. 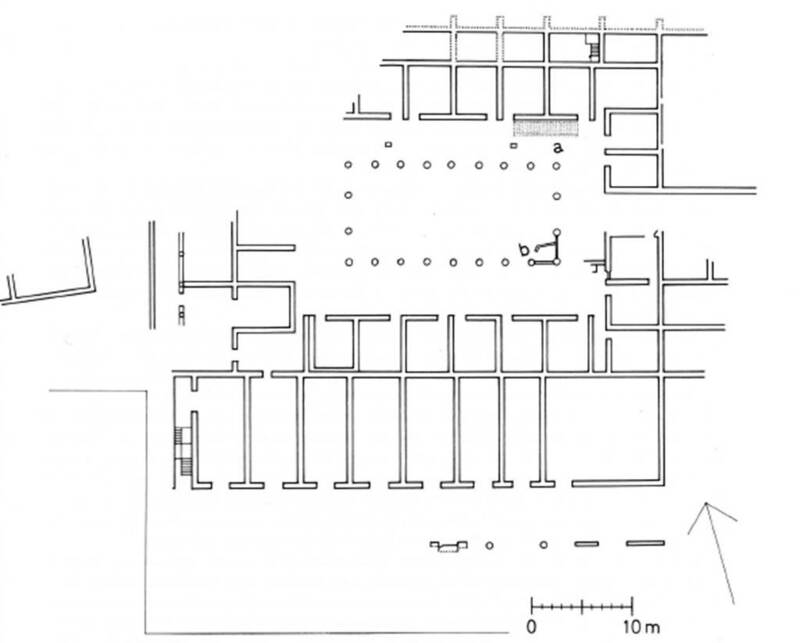 Funde und Forschungen in den Vesuvstadten 1: Archäologischer Anzeiger, Heft 3, abb. 36, p. 533. Oplontis, Villa of Lucius Crassius Tertius. 1977. 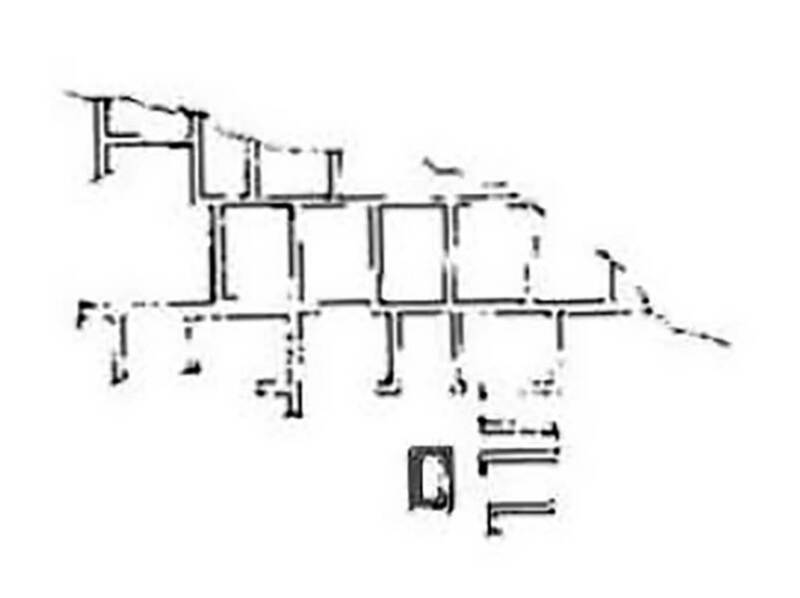 Plan by Malandrino of extent of excavations up to 1977. According to Malandrino, [writing of the excavation stage reached in 1977] the area of ​​the Mascatelle is rich in archaeological remains. 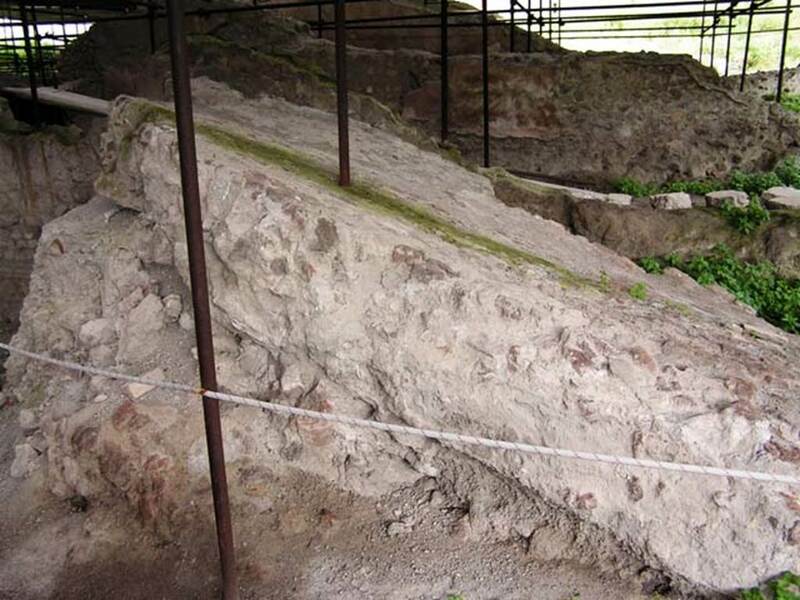 Ten years after the beginning of the excavation of the villa of Poppea, another monument was discovered. 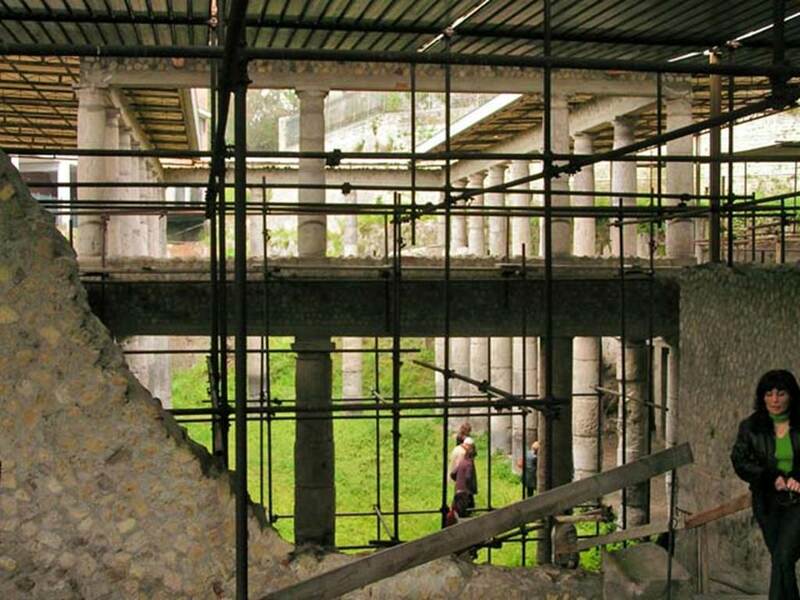 During the excavation of the foundation of the gym of a school building, there emerged the structures of another large villa, made up of two floors: the upper floor was a luxurious house and the ground floor rooms were used to carry out wine trade. The finding almost immediately of a bronze seal allows us to know the name of this wealthy merchant - Lucio Crasso Terzo. 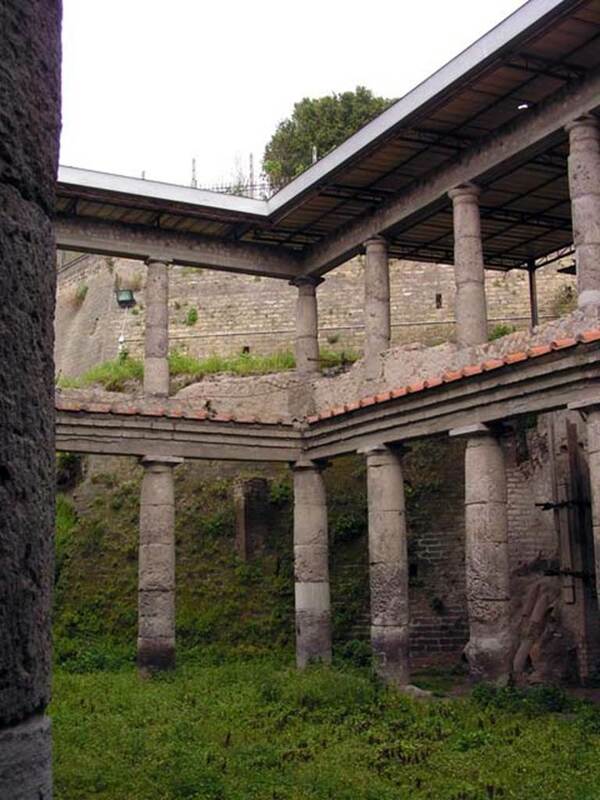 Unlike the villa of Poppea, this was inhabited and active, as evidenced by the various furnishings and the large amount of amphorae, many of which are still full at the time of the eruption, and others were inverted to dry after washing. 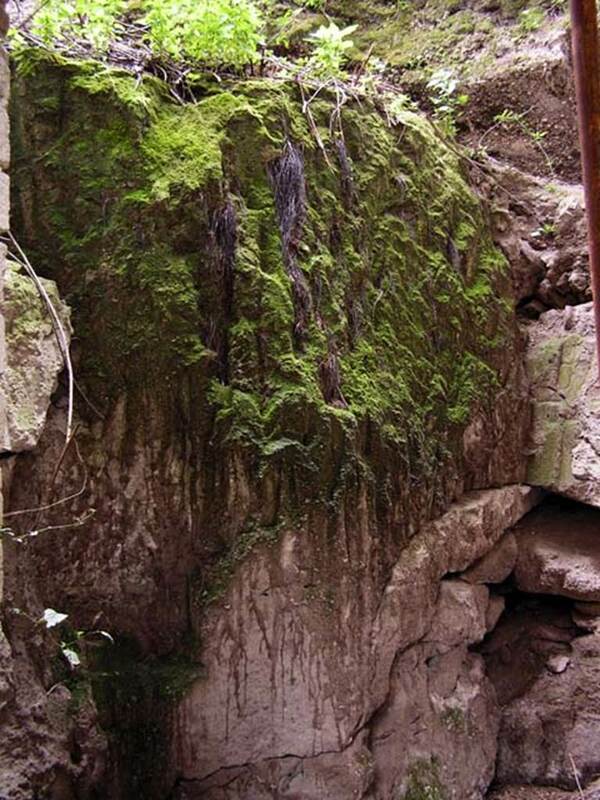 The archaeological interest of this discovery is particularly polarized on the vast array of structural features, covering the period from the end of the 3rd century. B.C. to the eruption. Not much is left of the upper floor, except for a few walls, in part finely decorated, and a nymphaeum. The ground floor is better preserved and consists of a number of rooms that, for their vastness, reveal the commercial use to which they were put. 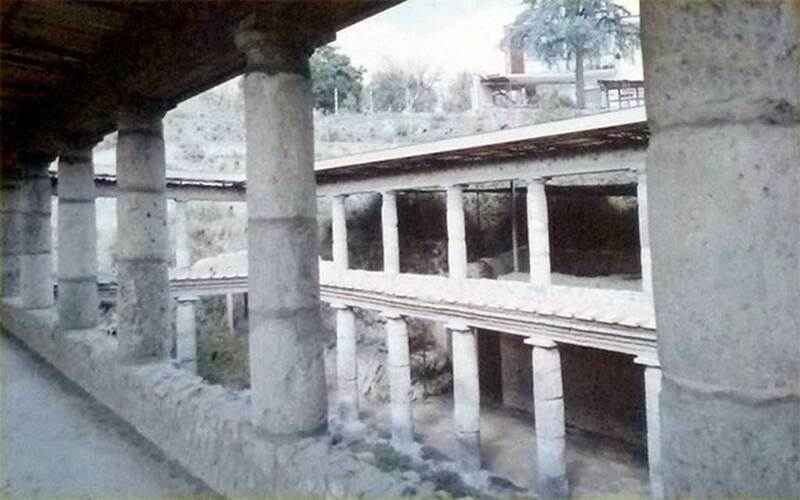 Of great interest, then, is the south side of a monument found behind and Ievel with the ground floor of the villa, with architectural and functional fusion with this, consisting of a colonnade with a double row of ten Tuscanic columns of Nocera tufa, from the Samnite era, dating from between the end of the 3rd and the beginning of the 2nd century B.C. This is probably the short side (east-west) of the monument, which will reveal its full extent, its importance and its destination when, after overcoming the bureaucratic obstacles, the excavation can continue. And not only that, it will also help us learn about historical moments and conditions of pre-Roman suburban settlements in this territory, which, even today, are so controversial and so full of unknowns. 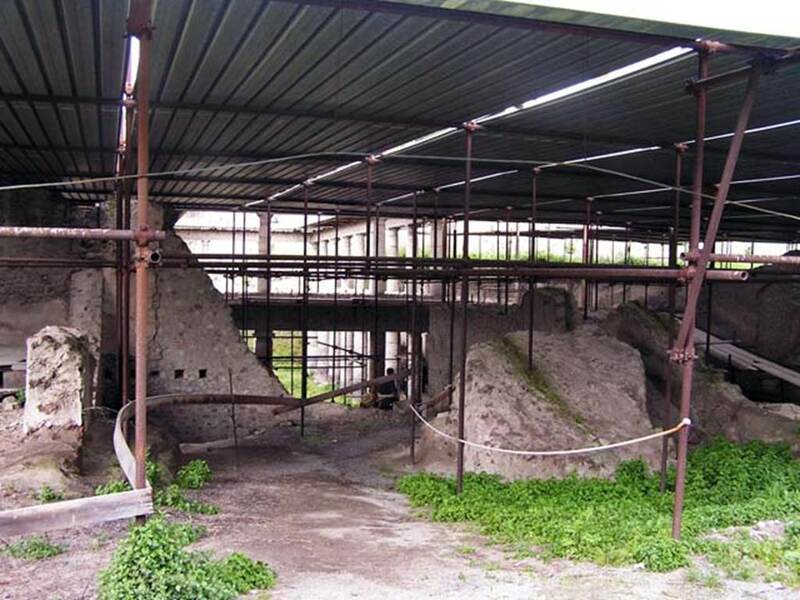 During the excavation of the villa of L. Crasso Terzo there was also found the first victim from the Pagus Oplontino, of which it was possible to obtain the plaster cast: She was a young woman, adorned with armlet and gold earrings, affected by the poisonous fumes while she attempted to escape in a vain hope of salvation. Oplontis, Villa of Lucius Crassius Tertius. November 2014. The villa with the wide entrance area on Via Gioacchino Murat. The villa is not open to visitors. Photo courtesy of Google Earth. Oplontis, Villa of Lucius Crassius Tertius. March 2005. Looking north from the entrance to the site. Oplontis, Villa of Lucius Crassius Tertius. March 2005. Looking south towards entrance on Via Gioacchino Murat. Oplontis, Villa L. Crassius Tertius. March 2005. Central courtyard 27 and two-tier peristyle, looking east. Oplontis, Villa L. Crassius Tertius. March 2005. Room 37, possible latrine in south-east corner of central courtyard 27. Oplontis, Villa L. Crassius Tertius. Looking west along portico 20. Villa of L Crassius Tertius. May 2011. Storage rooms 5, 6, 7 and 8 accessible from the peristyle areas 18bis and 36. On the wall can be seen the outline of a wooden staircase to the upper level. Oplontis, Villa L. Crassius Tertius. March 2005. Looking south-west across courtyard 27 from the upper level. 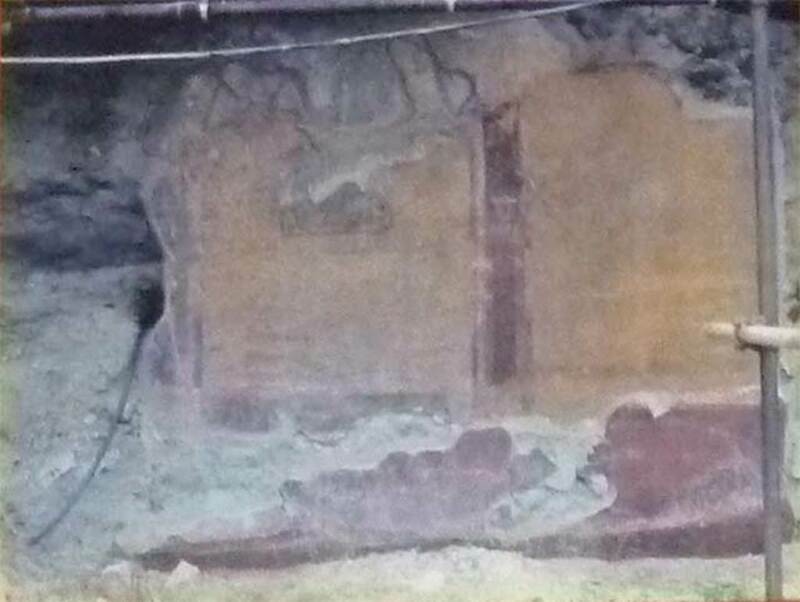 According to the Soprintendenza, il nucleo centrale dell'edificio è costituito da un porticato a due ordini di colonne doriche in tufo grigio di Nocera. 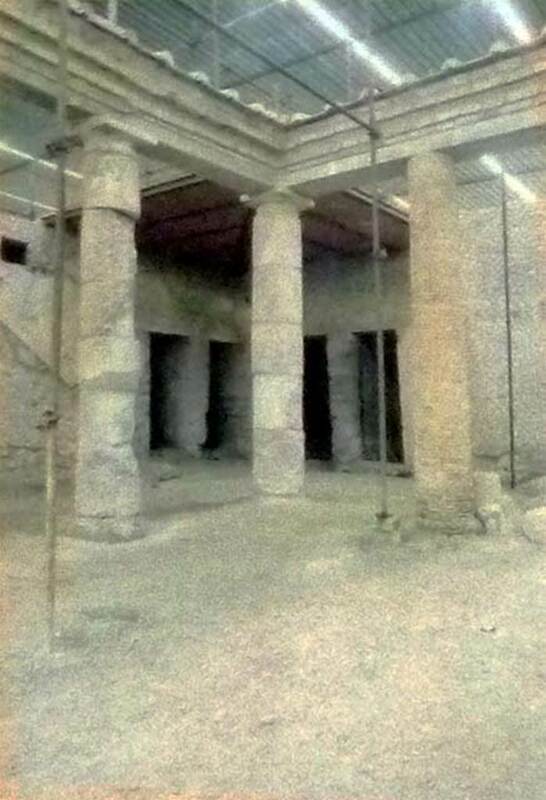 The core of the building consists of a portico with two rows of Doric columns in grey Tuff from Nocera. Villa of L Crassius Tertius. May 2011. Painted wall in Patron’s quarters. 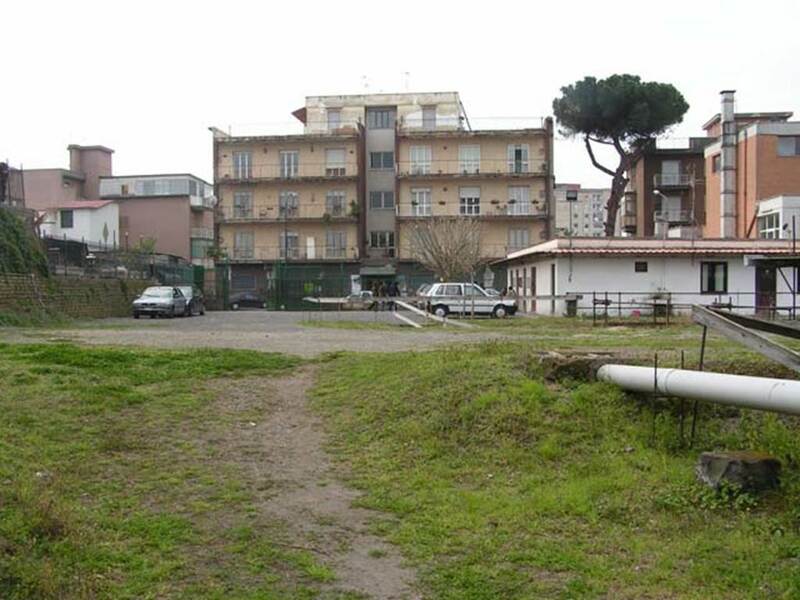 According to the Soprintendenza, il piano superiore, nel versante sud, è occupato da un quartiere signorile, forse la residenza del dominus, nel quale alcuni ambienti sono decorati con pitture in IV stile, ma tra i quali vi è un raro esemplare di II stile cosiddetto "schematizzato", risalente all'età repubblicana. The upper floor, in the south, is occupied by an exclusive area, perhaps the residence of the patron, where some rooms are decorated with paintings in the Fourth Style, but among them there is a rare example of a second style "schematic" painting technique dating back to the Republican era. Oplontis, Villa of Lucius Crassius Tertius. March 2005. Upper level at corner of rooms 18bis and 19. Oplontis, Villa L. Crassius Tertius. Area 19 at west end of central peristyle courtyard 27. Oplontis, Villa L. Crassius Tertius. September 2011. Looking down from the peristyle upper level across courtyard 27. Oplontis, Villa of Lucius Crassius Tertius. March 2005. North-west end of courtyard 27. Oplontis, Villa of Lucius Crassius Tertius. March 2005. Room 18bis, west end. Some of the 400+ amphorae found, many stacked upside-down. 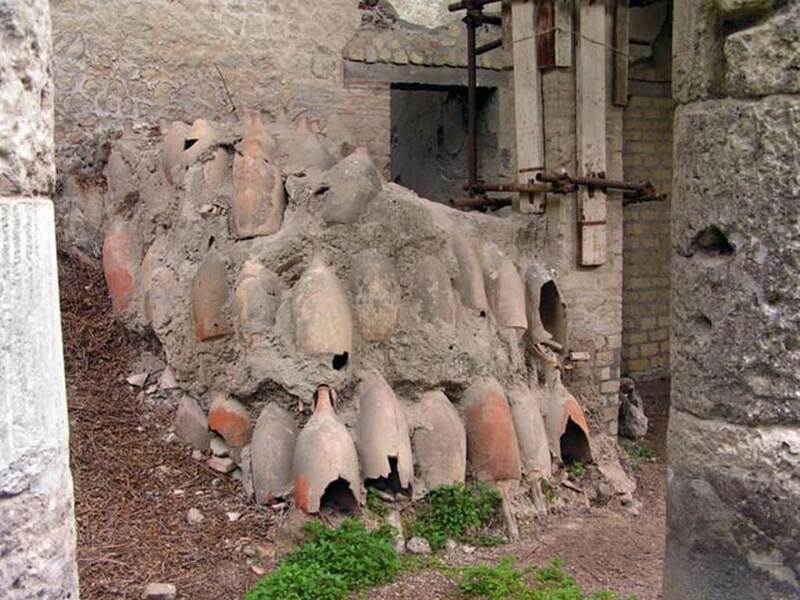 According to Malandrino there were many washed amphorae inverted for drying. This showed this villa was inhabited and active at the time of the eruption. Room 18bis Amphorae stacked upside down outside the door of room 17. 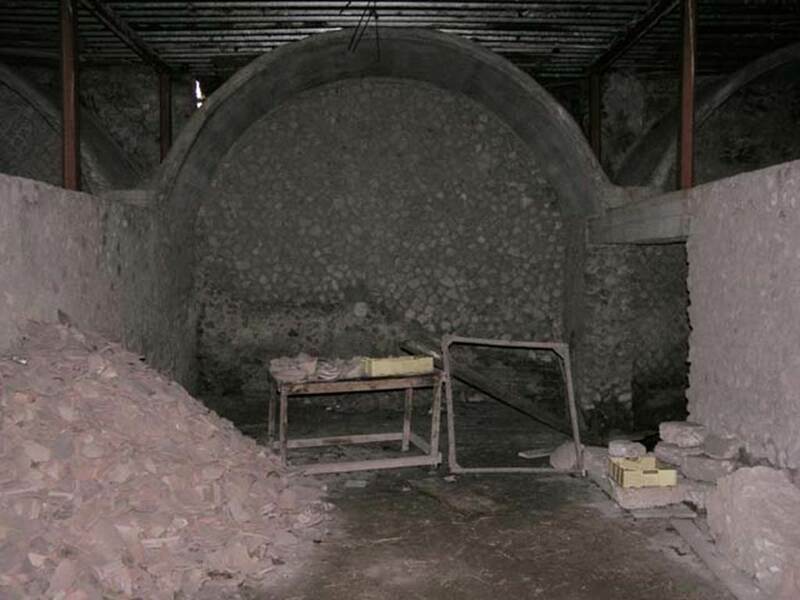 In their 2014 season the Oplontis Project undertook the cataloguing of stored materials that remained from previous excavations. They catalogued some 600 amphora, a significant increase from the 400 previously reported. Oplontis, Villa of Lucius Crassius Tertius. March 2005. Unexcavated area. Oplontis, Villa of Lucius Crassius Tertius. March 2005. Vaulted storerooms lined both sides of the courtyard. According to the Soprintendenza, I bracci del peristilio furono utilizzati come deposito di contenitori da trasporto: più di 400 anfore, in massima parte da vino, erano appoggiate ai muri, capovolte ed inserite l'una nell'altra….Una simile destinazione a magazzini sembra attribuibile ad altri ambienti, con copertura a volta, allineati sul fronte sud. 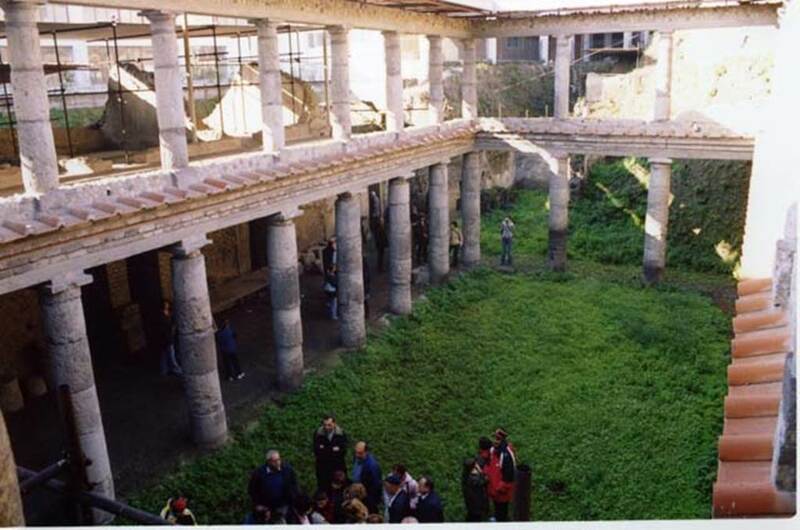 The arms of the peristyle were used as a storage depot for more than 400 amphorae, mostly used for wine. A similar use for warehousing appears to be attributable to other rooms, with vaulted ceilings, aligned on the southern front. Oplontis, Villa of Lucius Crassius Tertius. March 2005. Collapsed wall by room 9. Oplontis, Villa of Lucius Crassius Tertius. March 2005. Room 9, looking west across peristyle area 36 and courtyard 27. Oplontis, Villa of Lucius Crassius Tertius. March 2005. Rooms 16 and 9 at centre of east end.